Expectant parents who both plan on working once their child is born must consider their childcare options for their infant, and the decision can be difficult. Many families hire nannies and babysitters, while others opt for center-based care. The latter can be advantageous for a variety of reasons. When you decide upon a daycare center, you can be assured that you’ll be able to rely on that center to provide your family with care for years to come. 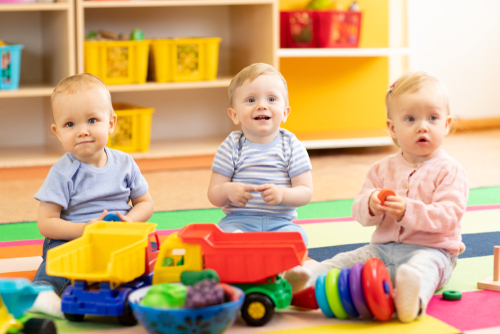 Most childcare centers offer infant care, a toddler class, and a preschool option, allowing your child to grow comfortable with their daycare over the years. Most daycare centers offer a curriculum which is geared toward your child’s developmental stage, and provides lessons, activities, and projects that help your child to build a foundation for future academic growth. Infants and toddlers who stay at home with a nanny have the option of play dates and activities, but the opportunities for socialization offered by daycare programs are unmatched. Daily exposure to same age peers is critical for the development of social skills and the building blocks of friendships. Hiring a nanny can be incredibly expensive, while daycare can be less costly. If you are planning on working full-time, you’ll need to choose between the two, and daycare is infinitely more cost effective. Most childcare centers stay open for long hours in order to accommodate the schedules of parents who start their work days early or end the day on the late side. Plus, daycare centers do not take sick days or vacation days! What led you to choose center-based care for your child? Help your fellow parents with some advice in the comments section!